Brian Wilkinson is a first-time author who was born and raised in Guelph, Ontario, and now lives in Toronto with his family. He has a background in journalism and a couple of degrees in the arts that have led him to his current career as a high school teacher and librarian. Prior to all of this, Brian was a journalist who worked in various capacities for publications like the Toronto Star, the Toronto Sun, and Kidscreen Magazine. He even landed an issue of X-Men working for Marvel comics. Combining his love of teaching and writing, Brian is releasing his first two young adult books, Battledoors: The Golden Slate, and Paramnesia, through Blue Moon Publishers in the fall of 2018. You can find out more at his website, bewilkinson.wordpress.com. Thank you for joining us today, Brian. Can you please start off by telling us a bit about yourself? I’m the luckiest guy in the world. I have a great job working in education, a wonderful and supportive wife, two kids, a dog, the whole nine yards. It’s been a long road to get here with lots of hard work, setbacks of various kinds, and all the rest, but ultimately I have done my best and now here I am. Now that I’m lucky enough to be writing books (and getting them published!) things are even better. I had some experience as a journalist and as a freelance writer for Marvel Comics, but all of that took a backseat to my main career as a teacher. Luckily, my career dovetails with my love of writing and has given me the opportunity to tell my stories! When did you first get bit by the writing bug? I remember quite clearly being in the 11th or 12th grade, in a creative writing class, and getting an assignment that was to put together a collection of poems or short stories, or to write a novel. I’m sure the last one was a bit of a lark on the part of a teacher who didn’t expect it, but I went home and wrote a 120 page novel over the course of a day or two. It wasn’t brilliant, but it also wasn’t too hard to put together. I say that and people roll their eyes. But honestly, it wasn’t hard for me. That’s when I realized that it wasn’t so much an easy thing to do as it was something that I had a knack for. Kids who excelled in other subjects like science baffled me… how can you just take to that stuff? That’s how it was for me and writing. Yet, I didn’t push it any further. I was content knowing that it was something I could do. I was a writer who didn’t write. Until recently, that is. Why did you decide to write stories for the YA market? I write for young adults for a couple of reasons. One, they are my main audience as a professional and I interact with hundreds of them on a daily basis. They are amazing, intelligent people who are bursting with imagination and potential. Plus, they’re just fun. As a teacher and librarian, I take in a lot of teenage culture both passively and actively. When I buy books for the school, I want to make sure that they are reading quality things. Part of that involves reading the books and YA in particular. Thanks to all of those influences and my personal enjoyment of the genre, it all naturally tends to bend in that direction. What is your favorite part of writing for this group? What is the greatest challenge? For me, it’s the instant feedback. I have groups at the school who share writing amongst each other and they just get really into things. Adults will read things, take it in and let it go, but kids breathe it. They become much more invested. Seeing kids argue about my characters and my work was just kind of surreal. They believed in my stories to a level that most others wouldn’t. It was humbling, to be honest. Which is also where the challenge comes. You want to make sure that it rings true, especially the characters, that the book is accessible, it’s enjoyable, and that is has some staying power to hold their interest. You also want to make sure that it speaks to them about ideas and themes in a mature way that isn’t condescending. Can you tell us what your latest book is all about? My books are meant to be fun. The tone is lighthearted, but there are serious moments and beats that hopefully make them a compelling read. 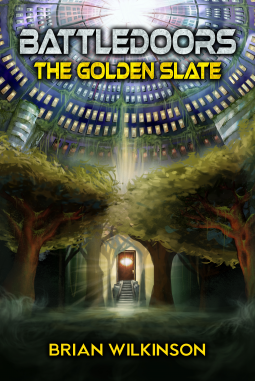 My first book, Battledoors: The Golden Slate, is about a teenager named Owen dealing with the loss of his mother and a move to Toronto for a fresh start. Though he tries to be invisible, he catches the attention both of a pair of bullies and a pair of girls, one of whom he has a crush on. All five of them then stumble across a magical object, called a Battledoor, which opens a doorway to a parallel version of our world. These kids need to make either/or choices that the Battledoor presents in order to get the story they are living to come to an end and get back home. It’s sort of a modern take on the old choose-your-own-adventure stories. They go to strange places, meet interesting people, and of course, take on the villain. My other novel is Paramnesia. This is a supernatural story about a girl named Nora who finds she has the ability to see the dead after she and her boyfriend are attacked by a creature known as the Revenant. Her boyfriend dies and she tries to get on with her life, but it’s hard when he still comes to see her. Nora meets other people, living and dead alike, who try to help her deal with her new reality. There’s a mixture of humour and horror here that I think works really well. I wrote my books shortly before the birth of my children. I was a writer who didn’t write because I didn’t have a particular need. When my children were coming, I looked around my house to see what there was that I might leave them one day. What was here that would remind them of who their dad was and how much he loved them? When I realized I was just looking at a bunch of ‘things’ I decided to write them stories. What you have now are edited and evolved from those stories; the originals of which I’ll find some way in the future to put in their hands. Really, though, these books are for them. The books aren’t out yet, but when they are, they’ll be available through most major book stores including Chapters/Indigo, Barnes & Noble, and Amazon. Order away! I have a sequel already written for Battledoors called The Black Spyre. Beyond that, I have several other books planned to follow up both Battledoors and Paramnesia. Hopefully people will want to read them! I’ve never written books before, certainly not on a scale like this. My hope is that people enjoy them and find something in them to connect with! Thank you for spending time with us today, Brian. We wish you much success. 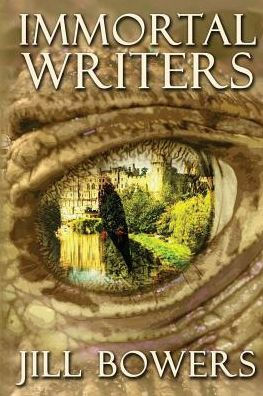 Jill Bowers is a freelance writer by day and a fantasy author by night. She’s the author of the popular Immortal Writers series, which is a five book young adult fantasy series. You can learn more about Jill’s books at her author website, immortalauthor.com. Jill is a lover of all things literature and music. She is one of two composers-in-residence for the Westminster Handbell Choirs in Logan, Utah, and plays many instruments. She’s an alum of Salt Lake Comic Con, Fyrecon, and MisCon. She has a beloved long-haired dachshund who enjoys walks and snacks, much like Jill herself. Thank you for joining us today, Jill. Can you please start off by telling us a bit about yourself? Hi! I’m glad to be here. 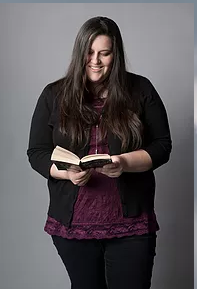 My name’s Jill, and I’m a young adult fantasy author. I love Netflix, Comic Con, music, and books. I’m an avid reader and I love to spend my time cuddled up with my dog in my TARDIS quilt reading. I’ve always had the writing bug. I’ve wanted to be a writer ever since I knew how to put my letters into words and sentences. For one thing, I enjoy reading young adult books, so it’s natural for me to be writing them. Mostly, though, young adults have to face a lot of problems in life, and I want to help them. I include real-life issues in all of my books, because I think literature and art are both great ways to encourage people to hold on. I love the fast pace of a YA book. I enjoy connecting with young adults; I often go to schools to teach classes and do assemblies, and I absolutely love it. My greatest challenge with writing for young adults is knowing what slang to use. I grew up in the “tubular” days, and people don’t say that now. Immortal Writers is about an author whose words and stories become so powerful that she gains immortality and her characters come to life. She has to learn to use magic and slay dragons in time to save the world from the villain she created. The entire series (book 2, Immortal Creators, comes out in fall 2018) follows authors who are in similar situations. If you like reading, you’ll love this series because you get to see your favorite authors (like Shakespeare, Tolkien, Poe, Hughes, Hemingway, Austen, and many more) as characters interacting throughout the series. If you’re not familiar with these authors, it’s a great way to be introduced to them. One day I was really angry because I thought my life was so dull. I wanted magic to be real. I wanted to slay dragons and fight monsters and be a hero. But then I started thinking about what the consequences would be if all of my favorite stories came to life; it would be chaotic. The rest of the series grew from there. You can purchase a copy at Barnes & Noble and from Amazon. First and foremost, I’m finishing the Immortal Writers series. Next, I have a middle grade fantasy that I’m wrapping up about a gnome and a magic garden, and then another series of young adult books, this time in high fantasy. Thank you for spending time with us today, Jill. We wish you much success.